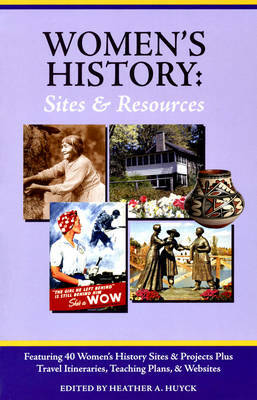 Women's History: Sites and Resources is a guide to sites in the United States devoted to the experiences and accomplishments of American women, from Jane Addams's Hull House in Chicago and the Women's Rights Historical Park in Seneca Falls, New York, to the National Women's History Project in Santa Rosa, California, and the Arizona Women's Heritage Trail. The volume provides detailed information on the histories of dozens of locations, including homes, workshops, business sites, and even the ships and shipyards made famous by "Rosie the Riveter" in World War II. Readers are invited to visit astronomer Maria Mitchell's Nantucket home, artist Grace Hudson's rural California log studio, Clara Barton's home and Red Cross headquarters, and the Colorado ranch where Adeline Hornbeck successfully homesteaded 10,000 feet above sea level. Other notable sites reveal the achievements and lives of Mary McLeod Bethune, Pearl S. Buck, Julia Grant, and Harriet Beecher Stowe. Entries also highlight key features to examine at each site, including notable paintings and artwork, unique architectural details, and interesting artifacts. The book's extensive resources include a bibliography to books, articles, Web sites, lesson plans for teaching women's history and making the most of nearby sites, and suggested itineraries for tours of sites.